Well, this has nothing to do with stitching and is not even interesting but I need to vent so here goes. DH and I have been saving to have a nice gravel driveway put in. We wanted a nice circular one with a space off one side for parking the boat and trailer. We finally got around to calling someone to have it done. Well, never mind it came in hundreds of dollars over the price he quoted us. I thought DH sounded funny on the phone when I asked him how it looked but today I went home for a laundry run and got my first look at it. You will note there is no picture because I don't want to have to look at it. For some reason the gravel is half dirt which will be great in the spring - a nice mudhole we can all track into the house. There is nowhere to put the boat and trailer - no gravel pad and there is a huge pile of sod and dirt there that apparently I am going to have to move and find somewhere to take? Literally tons of the stuff! At the space at the side of the porch where my pond and shade garden was going to go, there is a gravel pad. Oh yes, and the circular driveway? It is a rectangle! It looks like the parking lot at the front of a bloody strip mall! I understand now that that little change was made to save more lawn! Well, since the only thing anyone ever does with the lawn is complain about mowing it .... goodie. DH and I have discussed on occasion that we would be happier if the whole lawn were gravel with pots of plants on it. I am so mad to think that an entire month of my wages went to make this monstrosity. It looked better before he started. I guess I am the only one who will walk over to someone and say no - that isn't what we want. PO'd doesn't even begin to describe how I am feeling. And the best part? The fellow who did it is a neighbour so we can either grin and bare it - and pay up - or have a neighbourhood feud. Like I said before... oh goodie. Last Week's Giveaway Winner - Congratulations Marie-Andrée! The random number generator chose Marie-Andrée as the winner of the three books in last week's giveaway. Marie-Andrée, they will be on their way in the morning mail! Congratulations! I will be taking a break from the weekly giveaways for while as I am packing up now during my last week at the lake, getting ready to return home at the end of the season. Of course, I am also working trying to put the campground in order for the end of the season. Once I return home, I will leave almost immediately for a week in BC to visit my brothers and then after a short time I am off to the Annual CQI Retreat in Colorado - whoopee! I am thinking about teaching a mini workshop in crazy quilting for my guild in Calgary and was asked if there was something we could do in the way of a Christmas ornament. Well, I knew I had made some in the past so I went looking and found these photos. I had forgotten all about these since they were all given away. Of course, I have no cq ornaments on my own tree! lol It is certainly fun to look back at what I was making five years ago. Wow - where did the time go? I didn't think I had been doing cq that long - time sure flies when you are in the throes of such a glorious obsession! 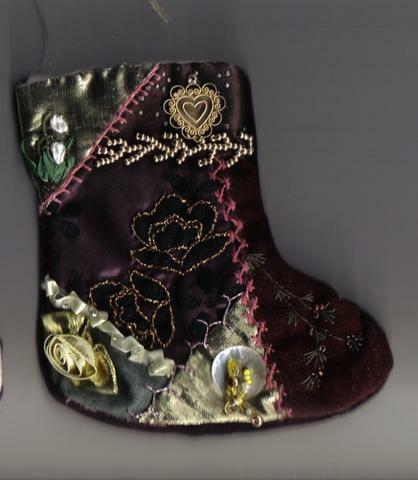 This one is pretty glitzy with the velvets and lame - quite rich looking. I do like the pine bough motif on the toe. The velvet in the middle was pre-embroidered in the gold when I bought it. This little mitt was done in cottons. The date on here is how I knew how long ago I made this and how long I have been cq'ing. Apparently I made this one for Flora - I wonder if she still has it? Even back then I was putting on the spider web and spider as a traditional wish for luck. Another little stocking - this one a mix of cottons and fancy fabrics. I liked these pine boughs - here's another one. I wonder if I copied it from something Hideko did - it looks vaguely Japanese to me. I like the beaded feather stitch near the top. Golds, silks and lame by the looks of it. Here`s a hint for anyone wanting to add lame to their cq project. Back it in iron on interfacing before you attempt to sew it - much easier! I learned that tip from my buddy, Barb Stuart, when I took a class from her years ago making a pieced log cabin Christmas tree skirt. Thanks Barb! Oh-la-la! Look at the lace at the top! lol - nowadays I would likely have dyed that before using it. I do like the silk ribbon mistletoe motif on the toe though! 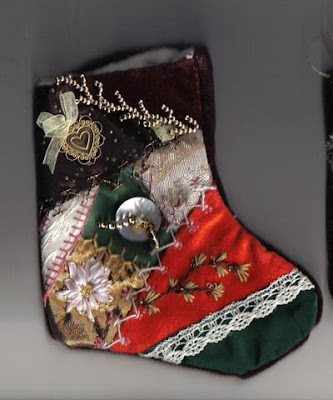 Another stocking - more cottons with some lame and moire. More pin boughs and mistletoe and another sad attempt at a SRE poinsettia. I must have just been starting to build my stash when I made these - it looks like the little gold hearts are the only charms I had! Same old, same old! Something new on this one though - a mother of pearl button snowman! How cute is he? lol I sure wasn`t much for seam treatments back in the day - looks like I used trim whenever I could. Well, thanks for joining me on this little trip down Memory Lane - I think I am inspired to make more of these now and keep them for myself! Or..... can you imagine them in miniature? As they used to say on Monty Python... and now for something completely different! I decided I wanted to make a dish towel and have just finished it today and would like to know what you think. Would you hang it in your kitchen? It's linen (I think or at least linen like fabric) and I put a decorative buttonhole stitch on three edges in blue over the rolled hem and the bottom side has a decorative pulled thread design. The teapot I embroidered in matching blue DMC thread. Well, maybe it is just as well if you don't want to hang it in your kitchen. As you can see from the penny in the photo, it might be on the small side! lol This is my first foray into the world of needlework in 1/10 scale for miniature dollhouses. Next I'll make another to match with a coffeepot embroidered on it instead and I'll have a pair. I learned a lot on this first small project so I think the next one will go easier and quicker. My mother always told me that people would turn my needlework over to see the back - so in case you wanted to do that, here it is. I think that this miniature needlework may be as great an obsession as crazy quilting! My dear friend, Gerry, is holding a wonderful giveaway on her blog, Older Rose. You have the chance to win one of these two delightful prizes. The first is one of Gerry's beautiful handmade pincushions, seen above. How extravagant is this?! 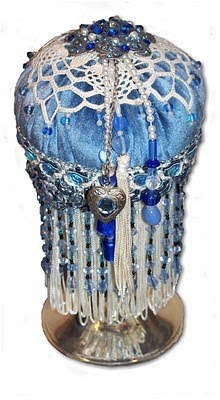 On top of the weighted silver base, the blue velvet pincushion is adorned with lace, beads, and other lovelies. It would be hard to lose track of your pincushion if you had one of these "Rise Above it All" ones! The other prize in Gerry's giveaway is a trio of her beautiful handpainted buttons. These buttons are one inch in diameter! She has painted the bluebirds on these highly luminous vintage mother of pearl buttons -I can't get over Gerry's artistic talent - she constantly blows me away! Wouldn't these look wonderful on a special crazy quilt project? You have until the end of the month to enter Gerry's giveaway so don't delay! This business at the top is supposed to look like lace at the top of the fan. I made diamond shapes with Gloriana Princess Petite Perle in pink above a purchased rose trim I stitched down. In each diamond I then did a diagonal and a horizontal line in two strands of white DMC. Then I did a small cross on top of that with one strand of the same floss. I wanted to add a bead at each intersection but ran out of time since I was already late in mailing this off. The first blade of the fan was this gorgeous dragonfly fabric and I didn't want to cover it up so I used irridescent Kreinik blending filament to highlight the wings. You can't see it all that well in this photo but it has a nice sparkle. For the seam treatments on each end of the fan I used a simple long and short buttonhole stitch in black Gloriana Princess Petite Perle. The next blade of the fan was the pink one. I used waste canvas to make the counted cross stitch pansy. Under that I added some meandering white silk ribbon and attached it with clear glass seed beads. At the top of the ribbon is a mother of pearl button sewn on with a yellow glass pansy bead. The seam treatment to the right of this fan blade is all done in the Gloriana again. First I did two rows of cretan stitch, creating the space in the middle. I made a small smyrna stitch in pale green in the space. At the top and bottom of the cretan stitches I added a clear glass seed bead and five detached chain stitches in a blue/green. To the left of the fan blade the seam treatment is made up of a row of herringbone stitch covered with a row of cretan stitch. The herringbone stitches are topped with a trio of straight stitches and a blue glass bead tops each cretan stitch. The next black fan blade cried out to me for a spider web for luck which I made in one strand of white DMC together with one strand of the same Kreinik blending filament. Hovering overtop is a purple sequinned butterfly. The seam treatment to the left is made of a gorgeous colour of Gloriana called peacock. I made offset semicircles of buttonhole stitch and added a small faux pearl at each turn. Time was really getting to be an issue at this point so in the last blade I added a pale blue lace floral motif. Bit of a cheat but you can't hang onto these blocks forever, as much as I would like to! Finally, this is the base of the fan. I used some leaf trim from Ribbonsmyth for this seam attaching it along the veins of the leaves with one strand of green DMC. Here and there I added the purple glass pansy beads. I actually really like the way the silk leaves blend with the leaves in the fabric. Well, the picture doesn't look like much, but these are my blocks for the Under the Sea DYB round robin I am in at CQI. The lovely ladies in this round robin with me are Nicki Lee, Ritva, Alice, Beryl and Carolyn and each of them will be completely embellishing one of these blocks for me in the Under the Sea theme. This will leave one for me to do when they come home. I love the underwater theme and can't wait to see what these ladies come up with! The blocks are pretty simple and are pieced with all my most gorgeous blues and greens in dupioni silk. Yummy! I am excited to stitch on these ladies blocks too since under the water is such a fun theme with lots of room for texture and colour! Every post needs a photo so here is Little Bear again to say hello! Here I am, thinking out load again and looking at my New Year's Goals to see how I am doing. It helps me to take a look at them periodically to remind myself of what I am trying to accomplish. As good as done! 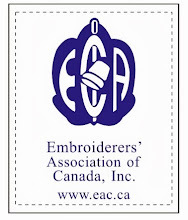 I have one class firmly set for early winter for the Continuing Education and have been requested to teach one by the Calgary Guild as well. I give up on this one. As soon as I make something suitable for a gift I give it away so i'm not going to have any type of backlog of gifts for Christmas. This just doesn't work for me so I'm cancelling this goal, for this year at least. Oh darn it - I would still like to do this and I haven't started yet. Guess this one stays on the list. This one takes some thinking about since my definition of competition is pretty loose. C. When I sent my Alzheimer's quilt in to AAQI, I made sure it got there in time to be comsidered for their exhibit so that counts for me. Especially since it was chosen! D. Hmmm... no 4th one yet? Will have to think about this some more. Well, yes, I still want to do this and no, I haven't done it yet. So I guess this stays on the list. I know I donated the art bra, the AAQI quilt, and a baby set to the hospital off the top of my head. I am going to have to put my thinking cap on to see if I can think of anything else I have done. One a month adds up to twelve a year so if those are the only three I have done then I need nine more by the end of the year to keep myself honest. I know I have some in the works still so I'd better get to work on them - easier once I am home with the sewing machine. This goal has been a lifesaver! I highly recommend this one for anyone. Since I suffer from depression in recurring cycles, and since anything creative is the first thing to suffer for me, attempting to stitch at least a little every day helps me to keep the creative dry spells at bay. It is true that a little stitching usually leads to more, so actually I am getting a fair bit done. I have to say that I consider this goal well met. Moving to the lake for the summer forced me into a break in this project but I hope to finish it before the end of the year, once I get home again. I am always surprised when I get to the end of the list and realize there were only eight goals! It seems like so much more in my mind! A couple of these I had completely forgotten about, so thanks for listening while I go through them again. You make a great sounding board, dear reader! I am already thinking of things I want to put on the list for next year! What a sunset! And the sun isn't even setting yet - it still has a way to go! This sunset is so spectacular because of all the smoke in the air here from the forest fires in British Columbia. Take into account that the fires are hundreds of miles away from here and it is pretty amazing. Even in the daytime, you can see the smoke in the air. It is like a thick haze on the horizon. What is usually a crystal clear view is muted and fuzzy looking. The lake and the smokey sky just seem to be blending into each other. To the west, you really can't see anything at all. The view of the next farm is usually so clear I can almost look in their windows and see what they are eating for breakfast, but now I can barely see the buildings. It is almost a full day's drive from here to the fires and yet it is still so smokey you can smell that campfire smell from all the wood burning and you can taste it in the air. I can feel my chest tightening up and I can only wonder how hard it is for the people who live near the fires? My heart goes out to the people who face the fires every year - hopefully these will be under control soon. Congratulations Lesley - plus this Week's Giveaway! First of all, congratulations go out to Lesley for winning the fuzzy fibre collection of yarns - have fun making seaweed or whatever tickles your fancy! Also hope you enjoy the three kits that go along! Please send me your mailing information and I will get this out to you right away. This week's giveaway is for three books from my rather eclectic collection. The first is "Teach Yourself to Make Angels & Fairies", written by Jodie Davis. There are instructions for everything from a teddy bear angel to a Raggedy Ann angel (so cute!). Just another case of not enough time to try everything! lol Maybe you will have better luck. The second book is "Stencilling: A Harrowsmith Guide". I love the old Harrowsmith magazine, Canada's answer to the back-to-the-land movement. I must have really liked this book because somehow I managed to buy three copies! So, one of them is up for grabs. Last, but not least, is "Hand Spinning and Woolcombing" by Grace M. Crowfoot and H. Ling Roth. Included in the volume are "Methods of Hand Spinning in Egypt and the Sudan" as well as "Handcombing". Maybe you know a spinner who would enjoy this? 1. For one entry leave a comment on this post telling me anything! 4. For a 4th entry, visit the Crazy Quilting International blog and come back and tell me in a separate post which round robin you like! 5. For THREE extra entries, become a follower of the Crazy Quilting International blog and come back and let me know. That's it - all there is to it! Good luck! Right now I am working on Arlene's blocks in the CQI Pansies DYB (Do Your Block) round robin. 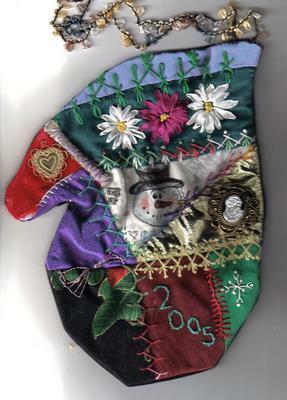 This is my work on the shared block: the large ribbon pansy and the seam to it's right. This is my first ribbon pansy I think and they are fun to make. Maybe I'll add a tutorial later on how I made it. The seam is a row of herringbone done in variegated perle cotton and then a row of cretan stitch overtop in Gloriana Princess Petite Perle. I used the Gloriana thread to add trios of detached chain stitch to the top and bottom of each herringbone and added a clear glass seed bead to the point of each cretan stitch. Five of us will be stitching on this little 6" shared block so there isn't room for me to do any more on it. This is the block so far. As you can see, there is some gorgeous work on here. I love the little crochet basket of overcast stitch pansies and the tatted butterfly is just great - love the colours! Once again this year the Alzheimer's Art Quilt Initiative (AAQI) is holding their World Series Quilt Challenge. 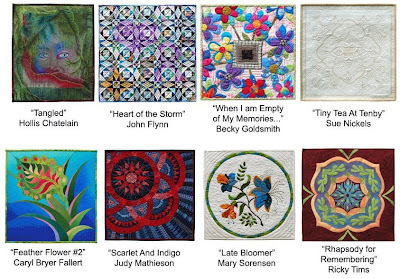 You need to head over and check out these gorgeous quilts more closely and read all about them. Last year over $11,000.00 was raised for Alzheimers research with this event and this year I expect them to raise even more! I can't decide which is my favourite? Judy Mathieson's Scarlet and Indigo? Rhapsody for Remembering by Ricky Tims? Or it might be John Flynn's Heart of the Storm! Hmmm... I might just have to cast more than one vote since I seem to have more than one favourite! I will be watching with interest when they are auctioned in November which is Alzheimer's Awareness Month. I have just finished up a block for Gerry in the Art Nouveau DYB at CQI. I showed a sneak peek earlier of the first motif I did on this block. This is the second one, some carnations in the corner of the block. This and all the other motifs I did came from a Dover Art Nouveau transfer book. I am glad I had it in my collection since Gerry requested all flowers and my knowledge of Art Nouveau flowers was somewhat lacking. I used two strands of DMC cotton floss for the greenery. The stems are done in chain stitch and the other bits are satin stitch. After working with one strand on the last motif, the two strands seemed kind of clunky to work with. The blossoms are done in a pink variegated silk thread in a rather sad attempt at long and short stitch. Definitely need more practice on that stitch! This next motif with the heart shaped flowers is entirely done in stem stitch, using silk buttonhole thread. I liked this one! Silk buttonhole thread was used again: stem stitch for the lines, satin stitch for the rest. Love the purple! Here is the finished block with the four motifs. I hope Gerry likes it - it was a bit of a struggle for me. I did three seam treatments as well: one green mini-ric rac attached with silk buttonhole thread in zigzag chain stitch, some silk Gloriana Princess Petite Perle buttonhole semi-circles in a gold variegated and finally just a wandering bit of green fiber that I thought was pretty. The blocks are off in the mail to Margreet now and hopefully the post office will be quick this time. I do not worry too much about any problems with the block because I know Gerry will feel free to tweak it and fix any inadequacies on my part. The other block in this set that is already finished was done by Hideko - it is wonderful! You can check out what she did with some gorgeous oyas here on her blog. What's a day without a post? What's a post without a photo? So, as you can see I will use any excuse to show off "the kids", my poms. The ginger coloured one is my old lady, Nala. She is quite content to snooze the day away in the trailer. The little black one is the new puppy, Bear, and she is barely content to sit still for a minute! DD, Katie, is a little worried how Bear will meld into the pack at home, and in particular with Duke, the bloodhound. She just shakes her head and tells me; "Great! She even sounds like a squeak toy!" I am pretty sure they will all get along though and I know Bear will love having so much more room to tear around in. Once again this year, Evening Star Designs is having a crazy quilting challenge and contest. The theme for this year is Enchanted and features beautiful silkies from the art work of Kinuko Y. Craft. I have decided to challenge myself this year and enter, and have recently received the package of fabrics and embellishments to use. First the embellishments: gorgeous threads, fibers and beads! Secondly: a beautiful array of fabrics of various types and textures! And, last but not least, you got to choose one of the beautiful silkies! This is the one I have chosen to use. You can see the others at the challenge page at Evening Star. Inspiring, right? I will keep you posted on how my entry comes along! This is such a clever idea I saw in one of the campsites this weekend. If I come back and do this again next year, I want one!! First of all it starts with a special tent designed for a shower. It is tall enough to stand up in and not very big. I have seen single ones before but this is the first I have seen that has two rooms side by side: a changing room and a shower room! Even better is the apparatus he has designed to go with it. This bit of construction, which looks like a hangman's scaffold, is built to come apart and go together very easily, of cedar which makes the whole thing very light and very portable. There is an actual household shower head running into the shower tent - one of the type on the flexible metal hose. This is then attached to one of the blue plastic five gallon water jugs full of water, balanced on the platform at the top of the scaffold. According to the camper who uses this, the height of the scaffold creates good water pressure for a nice shower. Also, once you open the spigot the blue jug will give you an eight minute shower. What luxury! After my fourth summer out here with no running water and having to drive at least half an hour in any given direction to find somewhere for a shower I think this would be the cat's pajamas!! Don`t people come up with just the cleverest ideas!? First of all, congratulations to Marilyn for winning the Crafty Kids magazine from the last giveaway! Email me with your snail mail information please, Marilyn, and I will get that right out to you. I am getting ready to be in a new round robin - this one is an Under the Sea theme. So, I was digging around in the stash to see what type of fuzzy yarns I have for seaweed, etc. I found over 20 skeins of eyelash, boa, chenille, feather, etc. types of yarn so I think I should share the wealth a bit. The first item in this week's giveaway is approximately a yard each of each one of the textured yarns I found in my stash. The second item is this cross stitch kit. It is cute but I don't think I'll ever get around to doing it. The 3rd item is a Bucilla crewel kit called Floral Butterfly. I have pretty well gone off crewel completely now so I'm not going to work this one up myself. 1. For one entry leave a comment telling me something you are celebrating! 4. 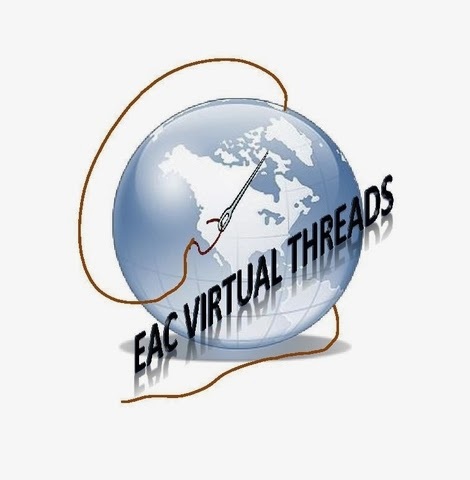 For a 4th entry, visit the Crazy Quilting International blog and come back and tell me in a separate post something you saw there you would like to try! I am currently stitching away on Gerry's block for an Art Nouveau DYB Round Robin at CQI so I thought I would give a sneak peek at what I'm up to. This is a design from an Art Nouveau book by Dover Publications. 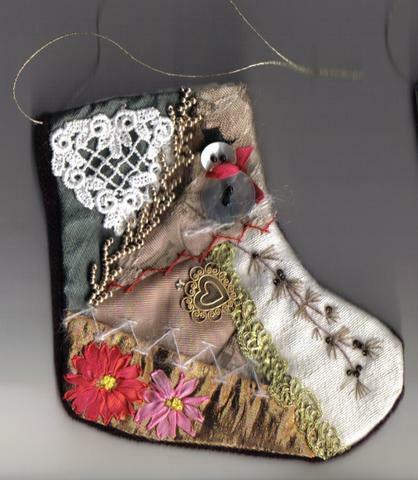 I outlined the leaves etc with stem stitch and then did satin stitch over that with one strand of DMC floss. I hope that Gerry will like it! I have just finished my work on Misty's block in a Novice Round Robin at CQI. I am working as a "Round Robin Angel" in this round robin because someone had to drop out. Elizabeth worked on the block before me and I absolutely fell in love with this seam she had done - mauve straight stitches in a repeating pyramid shape with blue beads at the end of each straight stitch. I loved how elegant this was and most of the work I have done is all around it. Such a pretty seam - I just wanted to nestle up next to it! Working down the right side of the block, the first thing I did was add a little black lace motif with beads next to Elizabeth's flower bead seam. The seam with the pink flowers came next. The flowers were removed from a piece of purchased trim. The greenery is a feather stitch with some detached chain stitches added as leaves, done in Gloriana Princess Petite Perle silk thread. I added a spider web for luck once I had flowers on each side of the blue patch to secure it to. The spider web is built with Kreinik braid and I built a spider hanging down by the lowest pink flower. The spider was made with more Gloriana silk and a bead using straight stitches and bullions. Two butterfly beads hover above the web. Moving down some more, I added another of the three dimensional butterflies I am enjoying making. The next seam is herringbone done in two strands of green DMC cotton floss and interwoven with a pale green suede-like thread. I added faux pearls from the strand I found at the thrift store. I built the button cluster with an interesting black button, two vintage glass buttons and a petit point piece removed from some jewelry. The seam below that is herringbone done in purple Gloriana, and layered on top of that is a row of cretan stitch in the Kreinik braid. Detached chain stitches were added to the herringbone, using the Kreinik. 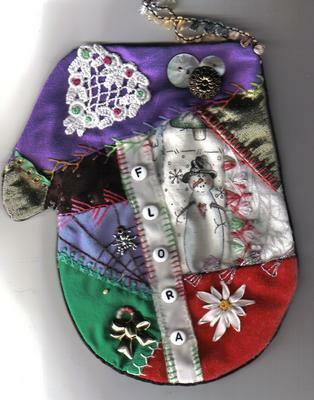 The last thing I added to Misty's block was an umbrella full of silk ribbon embroidery flowers. 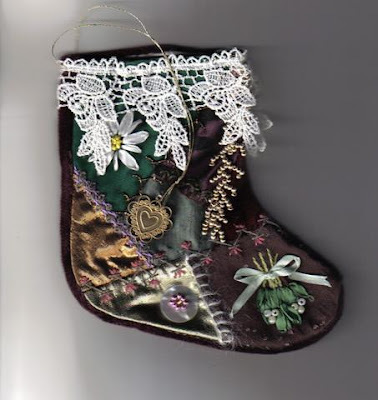 The idea came from a larger silk ribbon embroidery piece I admired in Threads, the South African needlework and craft magazine. I used the tracing paper method to transfer a design of an umbrella and used Gloriana Princess Petite Perle silk thread to stitch the outline. The flowers were spider web roses and sloppy french knots. 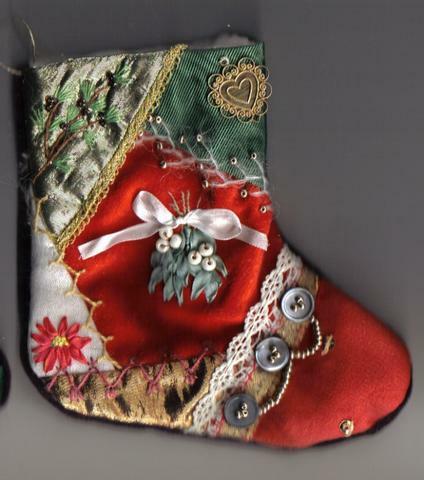 The leaves were chain stitch or ribbon stitch. All of the silk ribbon work was done in lovely hand-dyed ribbons from Treenway Silks here in Canada. Some of the ones used here were from the Montano series, my favourite! So, here is Misty's block, after Elizabeth and I have done our work on it. It is on it's way to Lisa now for her to add her magic. What is Crazy Quilting International?